Click here for over 100 photos from the tournament. TAUNTON, Mass. – For the second straight year, North Attleboro picked up a dominating win at the Hockomock League Championships, topping the tournament with an impressive 254 points. Oliver Ames finished second with 183, Franklin was third with 171, Sharon had 161 to finish fourth and Foxboro rounded out the top five with 155 points. Well before the finals even began, Big Red had a big lead but continued to add to it. The Rocketeers had a wrestler in half of the finals and finished with six champions on the day. It took less than two minutes in the 120 bout for North Attleboro to crown its first champion. Devin Spratt, who is climbing the all-time wins ladder for the Rocketeers, pinned Phil Dure at 1:45 of the first round to earn his second straight Hock title. Starting at 145, the Rocketeers picked four wins in five bouts. Nick Gould came away with ta last second win to get the title. He trailed 8-3 after two periods but a takedown from Stoughton’s Devlin Carroll pushed the lead to 8-2. In the final 30 seconds, Gould had an escape, near fall and a takedown to complete the comeback. Colin Fiske followed that up at 152 with a 4-0 decision – a takedown in the first and a reversal late in the second – avenging an earlier season loss to King Philip’s Anthony Fruci. The Rocketeers didn’t have anyone in 160 but in the 170 match, Big Red got another win. Jack Donahue built a 7-2 lead after one and then after a reversal in the second period, the senior was able to get the pin. Senior Nick Morrison then got a 6-4 win at 182 – his second straight league title in the weight class. A takedown in the first and a pair of escapes in the third helped Morrison edge Milford’s Ryan Gray. Brennan Sankey then capped North’s day with a first round pin in the heavyweight division. Other placements for North included a third place finish for Jordan Tillinghast at 160, fourth place finishes from Brady Folan (106), Brandon Graveline (132) and Leo Thibeault (220). Coming in fifth place for Big Red were Jake Direnzo (113) and Alex Devitto (126). The Rocketeers, who are 19-1 on the season and now have three tournament wins, knew that teams would be coming to try and score the upset. Oliver Ames finished second and recorded the most points in program history at the Hockomock League Championships with 183. The total was nearly 40 more points than their previous high, which was recorded back in 2013 at Franklin. Depth was key for the Tigers as they didn’t have a single champion but had two runner ups and nine other placements. Luke Cullen made it to the 220 final but was edged out 3-2 but Franklin’s John Miller. Pat Mills had a pair of wins in the heavyweight class but was pinned by Sankey in the finals. Casey Bellevue helped the Tigers cause with a third place finish at 106 and Jacob Murphy finished in the same spot at 170. Freshman Anthony Berksza continued to shine in his rookie year with a fourth place finish at 183 and Shea O’Connor (145), Ryan Lehane (152) and Carter Wood (195) all finished fourth as well. John Quilla (120) and Brendan Mills (182) both finished fifth. Sharon had the most efficient success in the finals as the Eagles sent a trio of wrestlers in and got three wins. Yosef Ellis-Rech had a pair of takedowns in the second period, sandwiched by a first period takedown and a third period reversal to earn the title at 113. It was a bit of revenge for Ells-Rech, who lost in the finals at 106 last season. Luke Stillman picked up a 4-0 decision over Milford’s Brett Kimball at 132, getting a takedown in the first and a near fall in the third for the win. David Ellis-Rech completed the strong showing for the Eagles with a 3-2 win over North’s Mike Gould. After a scoreless first, Ellis-Rech had a pair of escapes in the second but a takedown by Gould had things tied 2-2 going into the final period. At 1:19, Ellis-Rech had an escape to get the winning point. Ellis-Rech was selected as the Most Outstanding Wrestler for the meet. Franklin finished third overall, sent four wrestlers to the finals and had two overall champions. Jordan Carlucci started things off with a second period pin at 106 for the Panthers and John Miller had a 3-2 win at 220. Mike Racca finished second at 113 and Nick Narducci was runner up at 126. The Panthers were helped along by their depth as well with TJ Remillard (120) and Evan Hernandez (195) getting third place finishes and Ed Cropper (160) finishing fourth at 160. Foxboro’s Matt Kelley reached the finals for the third straight year and won for the second straight year. After winning 8-0 at 120 last year, he won 8-0 at 126 this year. 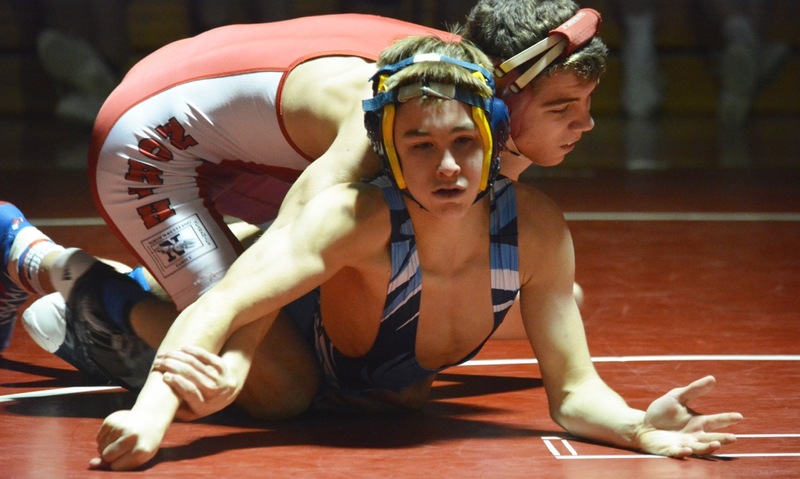 The Warriors also got a win at 160 via Matt Mullally and a 10-1 decision. Phil Dure (120) and Sean Smalley (195) had second place finishes. Milford’s Nick Johnson was the lone winner for the Scarlet Hawks, racing out to a 6-0 lead through two periods and holding on for a 8-1 win at 195. Nick Marcolini (106), Brett Kimball (132), Ryan Nesta (170) and Ryan Gray (182) each finished second for Milford. NORTH ATTLEBORO, Mass. – It seems that every season when North Attleboro and Franklin meet on the mats that a league title is on the line. This year’s meeting took on added significance because this will be the last time (at least until divisional breakdowns are reassessed) that the two programs will be fighting for the league championship. With North switching to the Davenport next year, the matchup will still pit two of the Hockomock’s top programs but there will not be a trophy on the line. North Attleboro took the bragging rights and clinched at least a share of the Kelley-Rex title on Wednesday night in the Kenneth Pickering Gym. The Rocketeers got off to a fast start, leading at one point 30-0, and closed out a 42-21 win over the Panthers. “I’ll say the same thing I alway say, beating Franklin is a good thing,” said North coach Wayne Griffin with a smile. The Rocketeers started with back-to-back wins by brothers Mike and Nick Gould. Mike, who was wrestling on senior night, got North in front with a 7-2 victory over Dylan MacLean and Nick, a junior, followed that up with a pin of Seamus Cogavin with 59 seconds left in the first period. North had the early momentum and started to roll. Collin Fiske added three points with a 9-2 win at 152 pounds, then three straight pins gave the Rocketeers a commanding 30-0 lead. Jordan Tillinghast (160) and Jack Donohue (170) both picked up pins in the third period and senior Nick Morrison (182) grabbed a pin with 1:01 left in the second. Franklin coach Carmine Colace knew that his young squad would be tested on Wednesdsay, but was pleased with the effort of his wrestlers to make North work for its points. Although North had a big lead, nothing had been decided, as Franklin had potential points waiting in the lower weight classes. Evan Herandez got the Panthers on the board at 195 pounds, pinning Brad White with 43 seconds left in the second period. John Miller cut the lead to 30-9 with a 5-0 win over Leo Thibault at 220, but North was handed six more points with no Panther to wrestle at heavyweight. The meet was not over as it headed to 106 and Jordan Carlucci gave the Panthers a little hope of a comeback when he picked up a quick pin just 35 seconds into his match. Mike Rocca followed up with a 4-0 win at 113, but Jake Direnzo did a solid job of avoiding a big loss or a pin guaranteeing North at least a tie. At 120, North turned to senior Devin Spratt and he came through with a fairly comfortable 10-3 victory over T.J. Remillard to secure the win for his team. Earlier this season, Spratt became the 11th Rocketeer to reach the 100-win plateau and is now closing in on 110 for his career, which would move him into the top five all-time. Nick Narducci beat Alex Devitto 6-2 at 126 and in the final match of the night at 132, North’s Anthony Biaungo and Franklin’s Amir Zamani saved the best for last. Zamani led 4-0 after two periods and was ahead 5-2 in the third, but Biaungo got a point for an escape and then as time was winding down he took a chance to go for the takedown. Biaungo managed to get the two points with mere seconds to spare, although the Franklin coaches insisted that the wrestlers were out of bounds. In overtime, Biaungo wasted no time to get a reversal for a 7-5 win. King Philip, 7 @ Attleboro, 6 – Final – Jacob Kelly had a hat trick for the Warriors in the victory. Sam Larkin scored a goal and had two assists for the Bombardiers. Canton, 0 @ Medway, 2 – Final – Justin Slocum made 25 saves in net for the Bulldogs. North Attleboro, 1 @ Franklin, 4 – Final – Franklin senior Jake Downie scored a pair of goals in the first period while Joey Blaise added another in the first and Adam Assad scored once in the third period. Zach McGowan scored North Attleboro’s lone goal and freshman goalie Ryan Warren had 37 saves. Oliver Ames, 6 @ Stoughton, 0 – Final – Freshmen Brett Williams and Max Ward each scored a pair of goals for the Tigers. 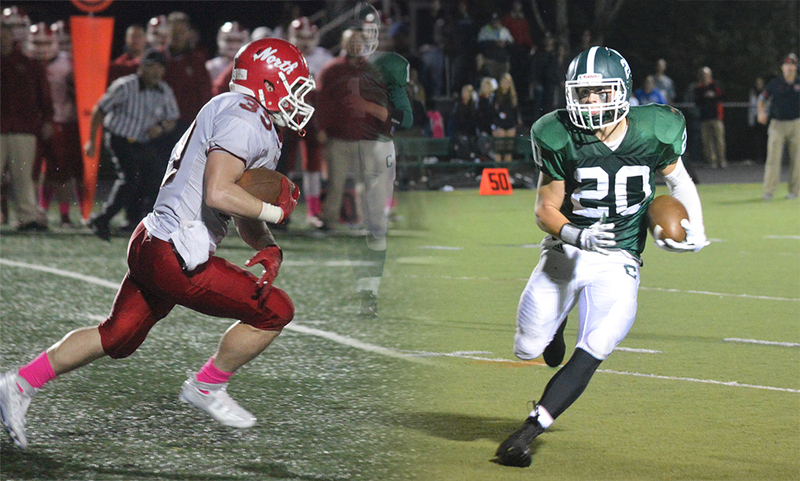 Franklin, 21 @ North Attleboro, 42 – Final – North jumped out to a 30-0 lead. Nick Gould (145), Jordan Tillinghast (160), Jack Donohue (170), and Nick Morrison (182) each had pins for the Rocketeers. Evan Herandez (195) and Jordan Carlucci (106) had pins for Franklin, which cut the lead to 36-18 with three matches left. Devin Spratt (120) clinched the win for North and Anthony Biaungo (132) finished the match for the hosts with an overtime win. North clinches a share of the league title. King Philip, 48 @ Taunton, 31 – Final – Taunton got wins from Josh Grasso (126), Justin Bradley (132), Alex Rodriguez (138), Nuno Camara (182), Elijah Simmons (195) and Santiago Lopez (220). 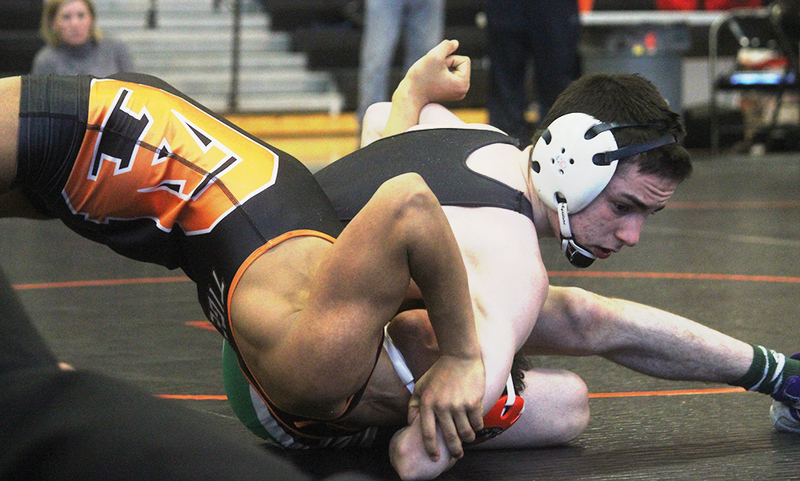 Milford, 26 @ Oliver Ames, 42 – Final – Oliver Ames senior Shea O’Connor (145) got a pin for his 100th career win. Franklin, 4 vs. Medway/Ashland, 2 – Final – Cassi Ronan scored a pair of unassisted goals to break a 2-2 tie for the Panthers. Elizabeth Quinn (assisted by Maddie Hinckley) and Jackie Connelly (from Marlee Paterson) had the other Franklin goals. Mansfield/Oliver Ames, 4 @ Cohasset/Hanover, 3 – Final – Cat Luciano scored a pair of goals and Lilly Feeney and Emily Ierardo each scored once for the Warriors. Below are the official Hockomock League Football All Stars, selected by the coaches in the league. NORTH ATTLEBORO, Mass. – All season long, the Rocketeers have forced turnovers and used a stout defense to change games. Unfortunately, that turnover never came on Friday night and Duxbury cashed in on two big momentum swings to take down North Attleboro, 21-10, at Community Field. 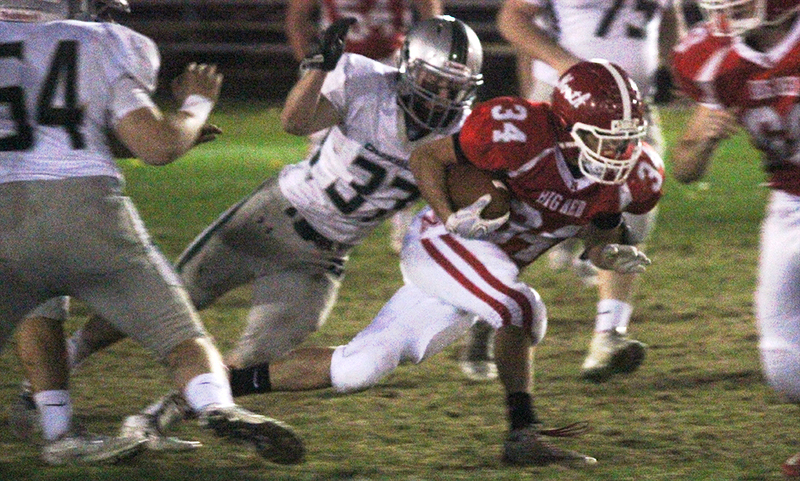 North Attleboro struggled for consistency on offense and managed 70 yards on the ground. The first big swing came right before halftime. North Attleboro led 3-0 following a 34-yard field goal from Connor Flynn and Duxbury was facing a third down in their own half. Dragons quarterback Bobby Maimaron rolled to his right and as he was being pressured, tossed a pass that sailed over the heads of his teammates on the bench. But a flag was thrown for pass interference and Duxbury’s drive stayed alive. Two plays later, Maimaron hit Darnell Riley on a slant route in one on one coverage and the senior raced the rest of the way for a 47 yard touchdown to put Duxbury ahead 7-3 with just over a minute to play in the first half. The Rocketeers had their best offensive drive of the game coming out in the second half. On the first play, North went play action and sophomore quarterback Chad Peterson (12/24, 157 yards) hit senior Ridge Olsen over the middle for a 55 yard pick up. Peterson hit Bobby Mylod for 14 more yards and two plays later senior Nick Morrison (10 carries, 28 yards) raced it in from six yards out to put the Rocketeers up 10-7. North’s lead was short lived as Duxbury came back and landed a punch of its own. James Cavallo got around the edge for a 28 yard pick up to get close to the red zone. On third and 7 from the North Attleboro 21 yard line, Maimaron hit Cavallo for a 10 yard gain. Four plays later, Maimaron called his own number and pushed it in from a yard out. The extra point was ruled wide but Duxbury regained the lead at 13-10. The other momentum swing Duxbury capitalized on came on North’s next series. Facing a third down from their own 31, a botched snap was recovered by the Dragons on the 29 yard line. One play later, Maimaron hit Cavallo over the middle for a 29 yard score. On the two point try, the reverse found its way into the hands of Cavallo and he threw it to Maimaron for the conversion. North went three and out on the ensuing drive and on its next series, a pair of penalties put them in a 4th and 27 scenario and Peterson’s long heave was picked off by Conor O’Neill. The Rocketeers defense put a stop to Duxbury’s attempt to add on to their lead with just over two minutes left when Nick Morrison sacked Maimaron for a 14 yard loss. Peterson his Barr for 35 yards and then 14 yards but with Duxbury loading up the secondary, there was another interception to close the game. North Attleboro is now 8-1 overall and will finish the season with one more game before it’s Thanksgiving game with Attleboro. Duxbury moves on to the D3 Southwest Final against Milton, who took down Stoughton on Friday night.